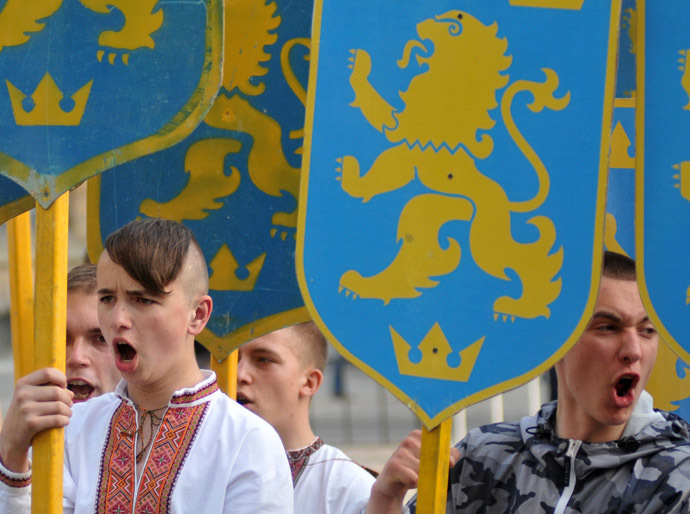 As the US/EU NWO war on humanity continues, and US funds continue to flow in to the Ukrainian Nazi Junta, what is left of the Free World has grown used to one outrage after another from the Nazis and their Western degenerate backers. But on 2 April 2014, a new high in brutality in the modern world was reached. What was reported to the Atlantic Anglo Empire's serfs and vassals as 31 dead in Odessa in on going street violence was much much worse and all bought and paid for by the Mordor on the Potemic. 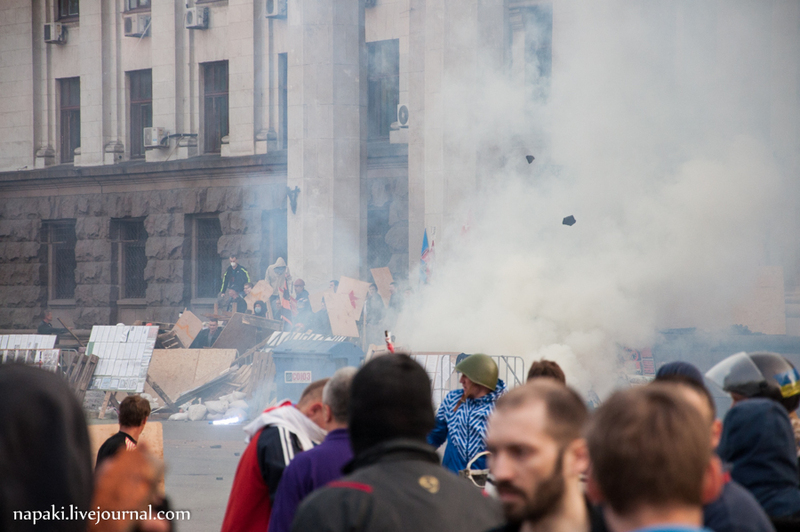 For several weeks now, peaceful protesters had set up a camp outside the TradeUnion House. This of course placed a sore point into the side of the Ukrainian Nazis and their Washington handlers, who are claiming falsely that the uprising in eastern and southern Ukraine is all Russian special forces. 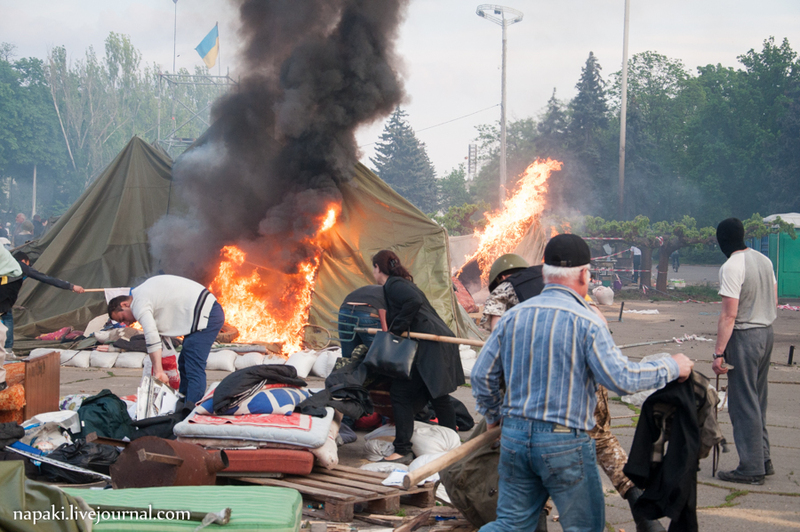 Yet here, in far off Odessa, which also happens to be Ukraine's last good harbor, is this huge and growing camp. Thus Kerry and company decided something must be done. 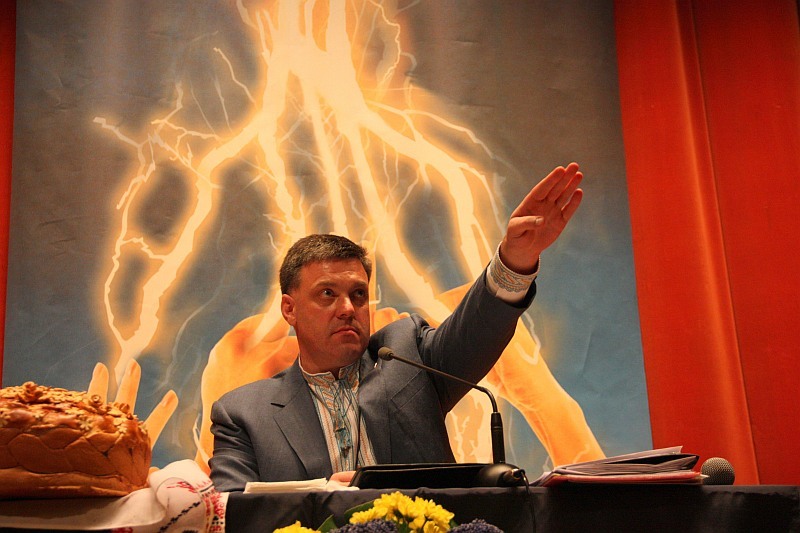 As it was, in the East, the new Ukrainian Nazi offensive started off to a bad show. After taking several checkpoints, the Nazi Donbass brigade, backed by reluctant Ukrainian conscripts, ran into a wall of fire. Three of the few functioning Ukrainian helicoptors were shot down. The infantry, as it approached the city ran into a hard rain of weapons fire. Citizens of all ages ran into the streets to build barricades. Old grandmothers filling sandbags. 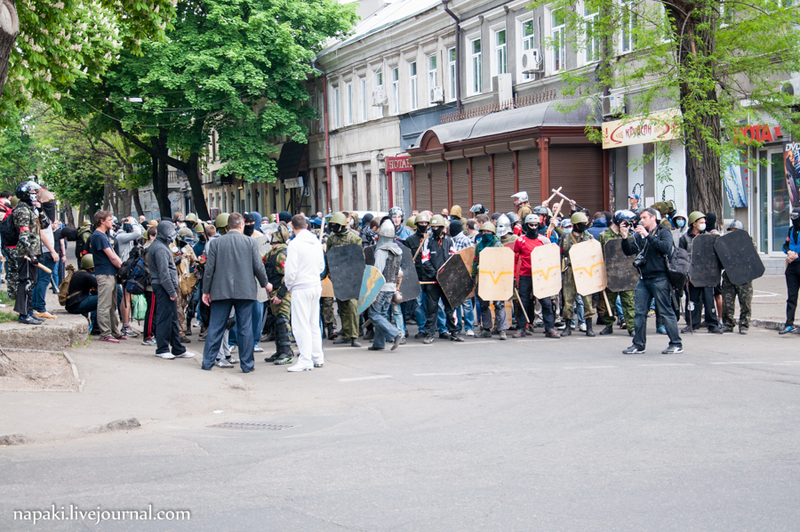 The defenders are waiting for the Right Sector goons to barge in to the Slovyansk meat grinder. Everyone has been armed. Later that day, in a northern village on the outskirts of Slovyansk, the US paid for thugs massacred 10 and wounded 40 locals who stood in the way of their APCs. 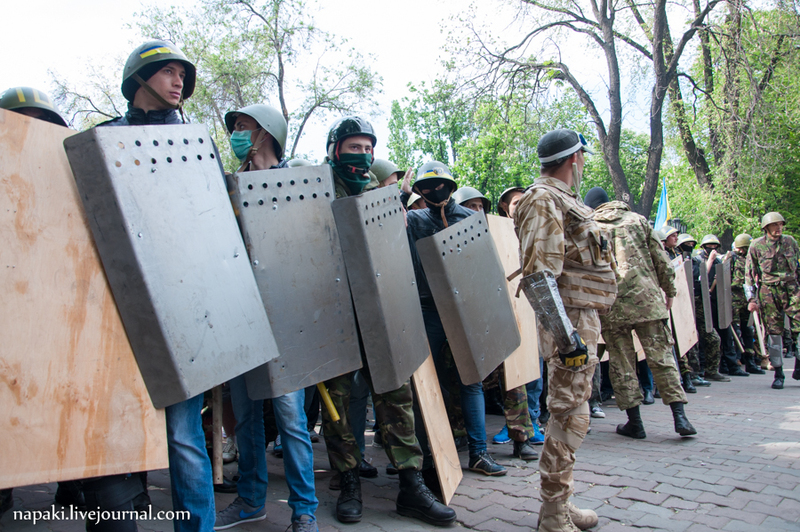 To this end a general mobilization of all fighting age males has been called up in Donetsk and Lughansk oblast. 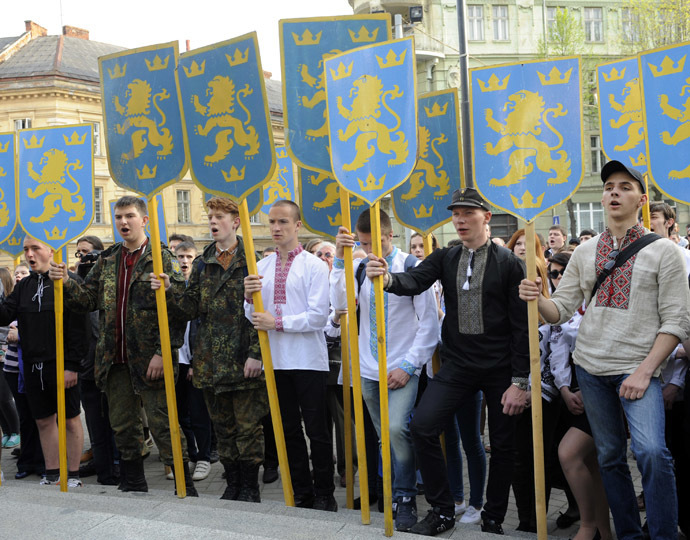 The new aim is to defeat the enemy in the East and march to Kiev to crush them there and hopefully the rest of the way to Lvov. The best case here is to send 10 million Ukrainian Zaporochi Nazi refuges into Poland so that they and the Polish pigs that also fund them and provide training for them can eat each other. But the worst human rights tragedy happened a long way from there, in Odessa. Pumping in by train football hooligans, that is paid for goons, from Kiev and Kharkov, Kharkov which is itself up in arms against Kiev, the IMF loan went straight to work. 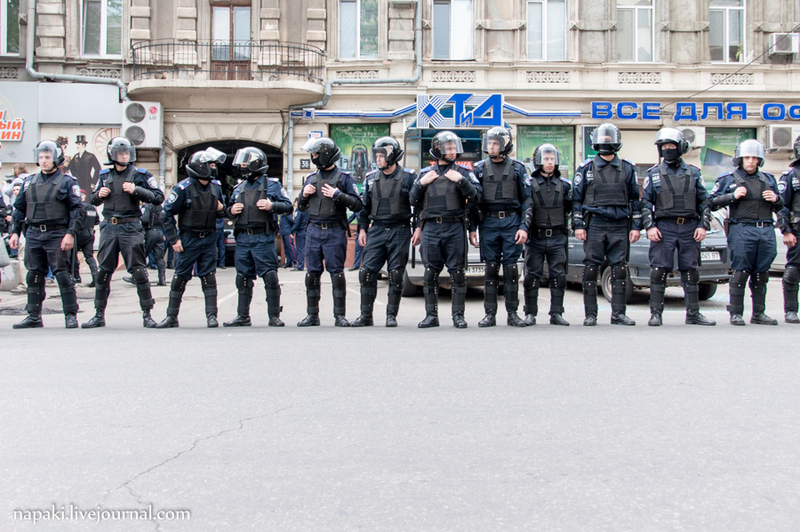 Mobilizing local Right Sector elements, backed by the hooligans, armed with molotovs, rifles and baseball bats, the crowd walked right past the Nazi controlled police. Never forget that the governors of all these regions are not elected but are officials, that is oligarchs, setup by Kiev in their own little fiefdoms. The Paid for crowd gathered to unleash Hell on the camp. Just some nice Right Sector girls spending their afternoon pouring Molotovs to burn dozens of people alive. The West's culture at its best. Teenage and young adults carrying molotovs with them with which they will cause mass murderer. Look how happy they are. As they marched on to the camp, they were enraged to find opposition. Of course there were only 250 or so armed defenders against thousands of Paid for Thugs. The police stood by uselessly. 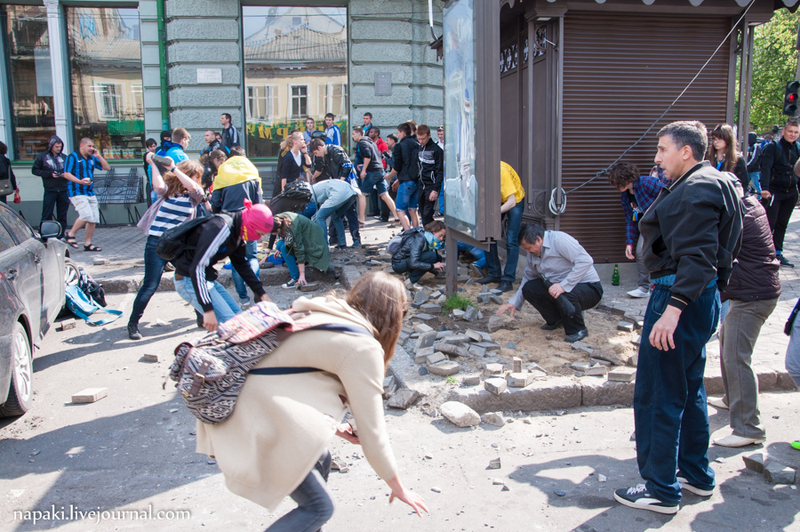 The Ukrainian Paid for Thugs attacked. 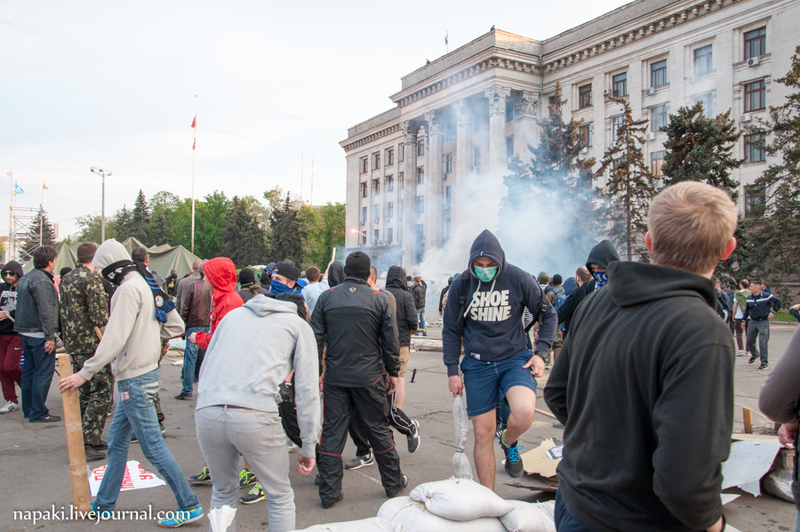 The battles raged back and forth most of the day, but the outnumbered pro-Federalization protesters were forced back into their camp and then barricaded in the TradeUnion House, while their camp was ransacked and burned. But that was no longer enough, not with the Paid for Thugs, the Hooligans, so the TradeUnion House was set on fire, with dozens of people barricaded in it. Those who tried to escape by jumping, were set upon by these human hyenas and beaten to death with baseball bats. Those who survived the fire inside, were later also beaten to death. Dozens of burnt bodies lined the floors. Over all, 38 people died inside and around that building and as many suffered severe injuries. As they wait for the desperate to jump down. The animals raise their flag after walking over the corpses of their victims. So the next day, while at the UN emergency security meeting, the sociopathic Western representatives were either in outright denial, blame Russia or look the other way, Latvian, Lithuanian and Polish politicians and diplomats were laughing on the blogosphere, talking about the Colorado Beetles are being cooked alive (the St.George Ribbon that the pro-Federalization side wears). This is the West, in all its disgusting, Satanistic glory. This is the subhumans who sit in power and will drive their lazy, dumbed down and foolish serfs to die under our machineguns. Why? Because we Russians will not retreat one step more. We are done, we will not just push back, but we will crush whom ever comes on our lands, be they NATO or these bastards. 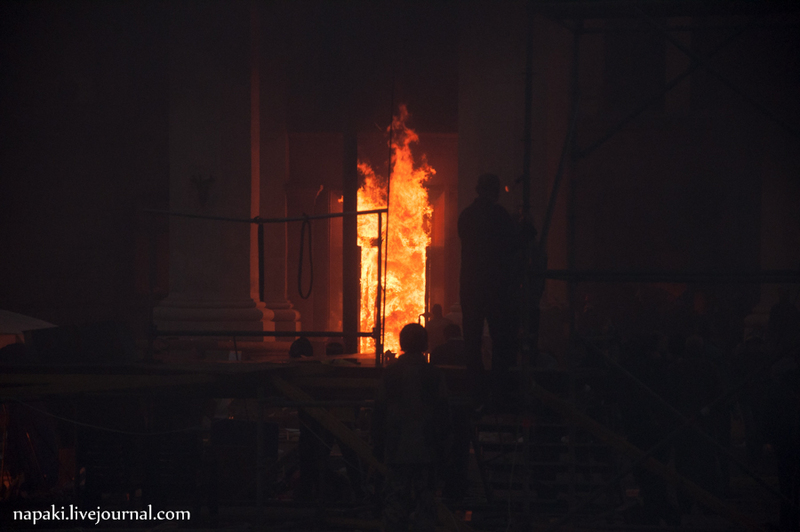 Meanwhile in Odessa, a large crowd came forth, tore down the Ukrainian flag and burnt it, while building this memorial. Mr Mishin, this is surely a bad, indeed very bad turn of events. There are millions all over the world who pray for your country. Really, the West has become something uncontrollable. Only seeking for one conflict to the other one. They will never stop. Neither will they come to their senses. It's so clear that they are out to get this Ukrainian conflict so out of hand that eventually they will start a war. We urge the Russian people to stand firm and never let it happen. America and the EU and the UK all are in cahoots with this plot. Because it's nothing else than that. All true Christians have to pray to our Father in Heaven to let these pagans not succeed in their senseless strive for a very dangerous coming conflict. USA, UK and EU have long gone already forgotten that there are a God who will not side with them. All of them also have forgotten their own history. 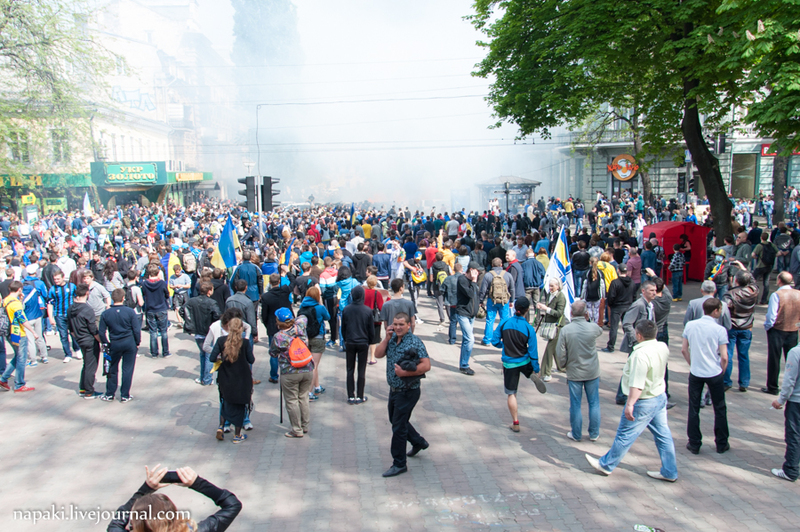 Kiev and its fascist/nazi backbone have spiked the center. Now its all out civil war. The secessionists in the East need to get armed, and fast. Russia probably will not move its army into Eastern Ukraine - that is a trap set by the US to divide Europe from Asia and Putin knows it. They just need weapons to stop APCs, tanks, and helicopters, then what is left of the Ukrainian army will be checked. Mat, can you post verified sites where we in the West (inside the belly of the beast) can make donations to the cause of the Eastern Ukrainians? I want to help, and many others want to help, but we don't know what legitimate sites to approach. 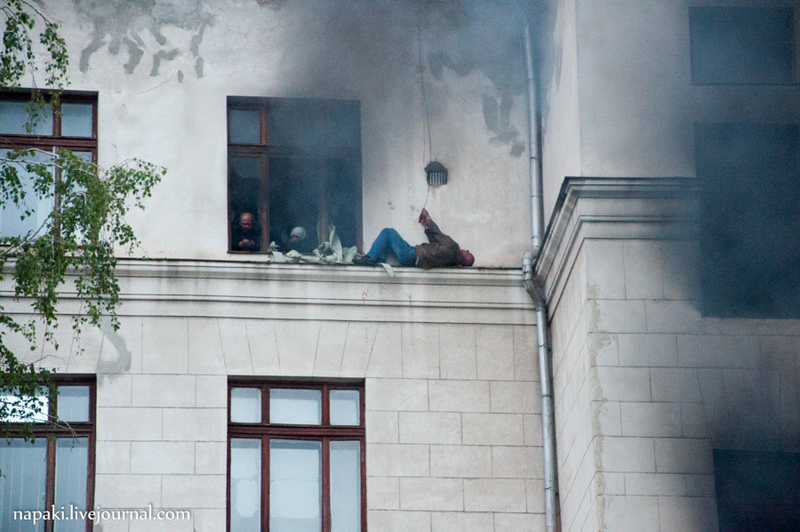 Can you also post the names and bios of those that perished in the building in Odessa? They are martyrs that should not be forgotten and will inspire us to fight on. I was especially saddened to see that young women died in that building. Arius, thank you for your sentiment. At the present, I am not aware of such a site to contribute. 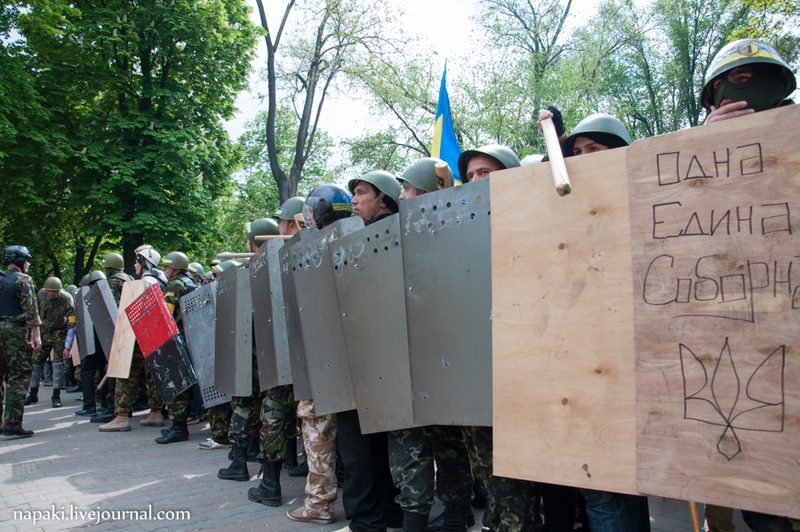 The Donbas in rebellion has started a full mobilization of all fighting age males. The first true combat unit of veterans of previous service, including afghanistan, has already formed with 1,000 volunteers, this is beside the militias guarding the towns. So this will be all out civil war. The best thing to do now, in your home country, is to spread the word, organize demonstrations. Oust the warmongers. People need to understand this is not going to be Libya. There will not be bloodless for America and EU victories. This will be a full war of attrition and their children will be seized for cannon fodder. If they are to stupid to understand that, then well, they are lost. Not all of us in the West are stupid enough to believe the rampant propaganda. Please understand that. The majority are blind, but there is a strong minority who are aware. Of course, they are constantly told they are "Putin supporters," or anti-American, etc. Something that interests me a great deal is your take on Finland's stance. Will Finland give in to EU pressure to implement sanctions? I pray that Finland will maintain its historic good relations with Russia (well, since the Finno-Russian war caused by the communist Stalin), or will stupidity prevail? Finland has in general shown to be independent, but now that they stupidly joined the EU, things may be different. My God. This should be on the evening news in the USSA. I'll pass this link on, to as many as I can. Its hard to say. As has been show, to non others more than to their own publics, the European politicians are totally bought and paid for by US dollars and NSA blackmail. All are compromised and couldn't give a bigger damn about their own serfs. So while Finland's economy breaths and lives in parallel with Russia, its politicians maybe anything but. Of course it only takes 1 to say no. Also the May EU Parlimentary elections will be the bell weather for years to come. If anti-EU nationalists, such as Le Pen's National Party or the UKIP win big, its over for Cameron, Hollande (well its over for him regardless) and Merkel. This is what any 8 year old would have told him 10 years ago about the evil characther of angloamerican regimes. This lavrov is either scizophrenic or a real traitor to Russia. work of diplomat is to assert and maintan the interests of the nation-he has done none in his tenure. in fact he always backtracked on his stand whether in syrian talk or libyan talk or here in ukraine. Don't be too hard on the Russian government. After all, they followed America's orders by not selling Iran the S-3000. Like a good dog, Putin will continue to play ball with the American elites. Does RUSSIA NOT REALIZE THAT IF EVER IRAN IS ATTACKED AND DEFEATED BY USA ATHEN RUSSIA WILL LOSE ALL STATUS AND PRESTIGE OF EVEN THIRD RATE PWOER INT HE WORLD AND THEN NO COUNTRY WILL BE WIILING TO BE ON SIDE OF RUSSIABECAUSE EVERYONE WANTS TO BE WITH A STRONG SCOUNTRY WHO CAN ORDER AND MANAGE THE AGENDA AS AMERICA IS TRYING TO DO AND THEN RUSSIA WILL BE =DESTROYED AS IS THE VERY INSTEDSION OF USA? RUSSIA MUST NOT LET USA SCORE ANY MORE POINT ANYWHERE LET ALONE IN IRAN OTHERWISE RUSSIA IS FINISHED EVEN AS A COUNTRY . What it is that lavrov is smoking ? Must be very potent hallucinogen. He still talks of negotiation with Ukraine junta after Odessa atrocities by the Zionist and fascists goons? Thereby giving legitimacy to the kieve junta despite all crimes? 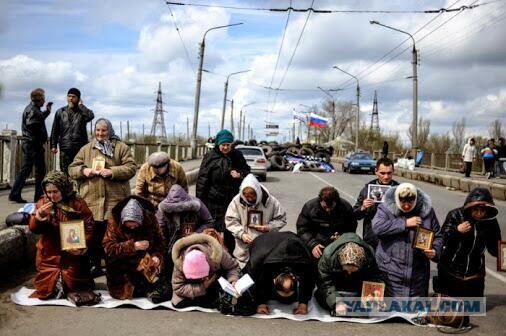 The east ukraininas shouldn’t wait for russian help because Rus leadership is sold out and feel satisfied as junior member of west with a few crumbs under the table- (though even then Russia will get nothing –remember 90s ?) . When do you think Russia will intervene even indirectly-when the nato tanks are already moving west from austira andf east from Poland at this moment.? Russia has lost momentum as it always ndoes because it is more concerned with what she will look like to western eys than what she can get done on the ground. As Paul Craig was saying Russia shouldn’t have bothered about image and should have acted as soon as kieve junta was installed. Russia is in grave danger because of her foolishness and so what help can you expect from her as her allies? Nothing. As for south Ukrainians they should run a guerrilla warfare with support from who so ever is willing to fight on behalf of freedom(donto count on Russia) and make life so miserable for keive junta that they are forced to grant you autonomy or a separate state away from Ukraine or Russia. You need to lay off the propaganda juice and get real. Here are some real facts for you. 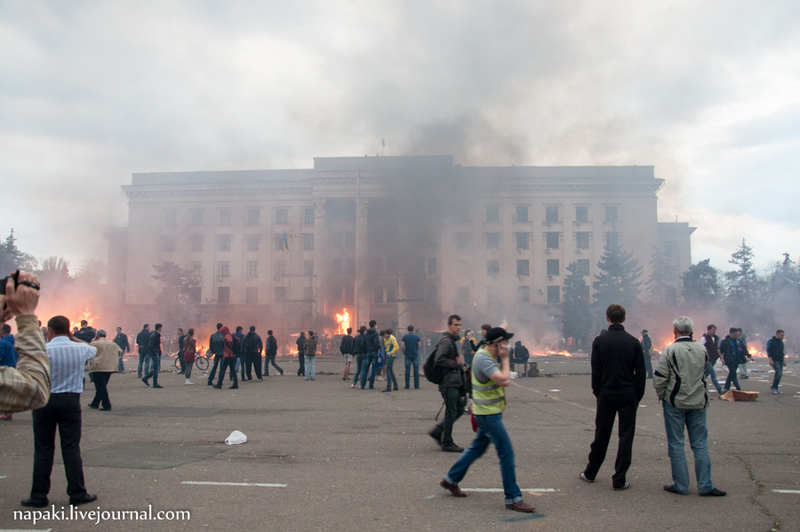 Of the people killed in the fire or jumping from the burning building, NONE WERE ODESSA RESIDENTS. By one report, 10 were from Trans-Dniester and 15 were from Russia. They had Russian weapons with them. The SBU published photos of their passports. "Yesterday, however, according to a major Ukrainian news site, TSN.ua, the website of the President of Russia’s Council on Civil Society and Human Rights (shortened to President’s Human Rights Council) posted a report that was quickly taken down as if it were toxic radioactive waste. According to this purported report about the March referendum to annex Crimea, the turnout of Crimean voters was only 30 percent. 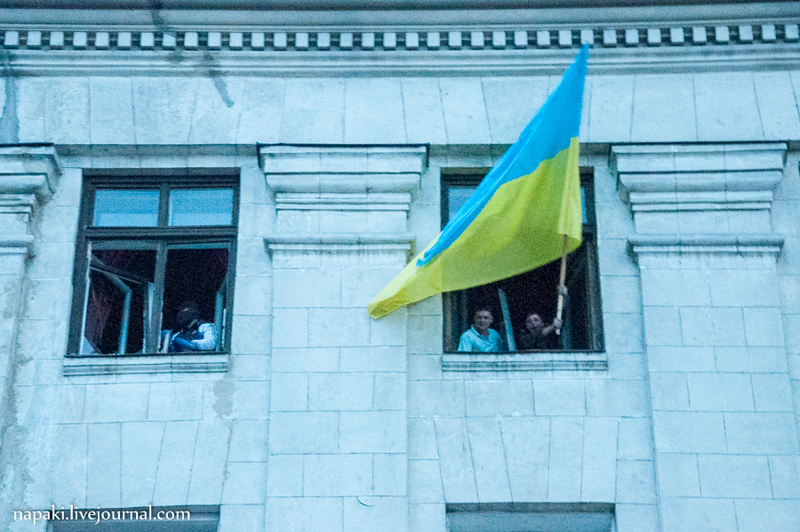 And of these, only half voted for the referendum–meaning only 15 percent of Crimean citizens voted for annexation." Oh, yes the government controlled Ukrainian press...yes, that is the best sources of ludicrous BS yet. The fact that the victims relatives came out the next day and are burying them locally and staged an attack to release the rest from the Kiev cops, well we'll ignore that too. What idiocy. But thanks for playing. Of course, according to your masters they all burnt themselves to death also. @Matamoros: Forbes as a source of objective, accurate information? Lordy. What are you smoking? Forbes is pure propaganda for Wall Street parasites, war mongers, usury, and world-destroying evil.